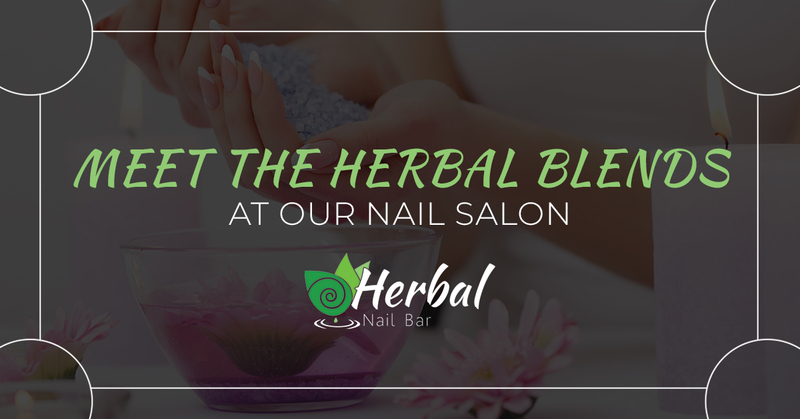 At our Naples nail salon, we specialize in herbal-infused, house-blended products to give you the absolute best and natural manicure you’ve ever received. All of our herbal manicures and pedicures offer you the choice of which blend you want us to use. Each blend offers different benefits, but all will leave your hands and feet feeling smooth, soft, and supple. In today’s blog, we’re taking some time to go over each of our herbal blends so you know what to expect when you come in! If you have had a long day at work or the kids were acting particularly crazy this week, then this herbal manicure blend of lavender and chamomile is for you. Lavender is relaxing and calming, while chamomile has almost sedative-like effects to ease your mind of worry. The earthy scent of rosemary blends perfectly with an invigorating peppermint, leaving your hands and feet feeling tingly and awake. As the scents enter your olfactory system, they clear your mind with a fresh, clean aroma. The herbal detox blend at our organic nail salon includes a lively mix of antioxidant-rich ingredients, including green tea, lemongrass, and rosemary. Lemongrass is often used in aromatherapy to relieve muscle pain and aches, while green tea is a natural anti-inflammatory. The caffeine in green tea helps to give your skin a nice complexion when applied topically. This blend of detoxifying ingredients has a grounding earthy aroma and leaves your skin feeling amazing. One of our favorite blends at our Naples nail salon is this calming tea blend we use in our organic manicures. A mixture of ginger root, green tea, and lemon essential oil, this blend is both warming and fresh. The smell and taste of ginger root calms the stomach and nervous system while the green tea and lemon soothe the skin. What better way to awaken the senses and refresh your mind than with this peppermint and spearmint blend? These cooling and tingling oil blends are familiar, fresh, and uplifting, making it the perfect choice for someone who just wants to feel clean, cool, and clear-minded. If you’re feeling a little stuffy, this sinus-clearing blend of eucalyptus and peppermint is the perfect option. Both eucalyptus and peppermint contain menthol, a naturally occuring compound used in over the counter medicines to clear up congestion. Breath easily while we pamper your hands and feet! If you are feeling a little tense, consider our eucalyptus and rosemary muscle tension blend. We will massage your hands and feet while you relax, using this blend of herbal scents to clear your mind, keep you grounded, and invigorate your skin. Time to wake up! Coffee lovers will melt over this energizing coffee scrub and soak. Coffee essential oil has been known to boost moods and awaken your skin thanks to the natural caffeine. Plus, it smells amazing! If you stop by for one of our herbal nail services, you will be treated to a softening hand or foot soak with the herbal blend of your choice, followed up by a gentle exfoliation to remove dead skin and build up. Then, we will treat you to a herbal hand or foot mask, nail shaping, cuticle clean-up, and massage with a hydrating lotion. And of course, a beautiful application of your choice of nail polish! To experience the most relaxing and natural pedicure or manicure of your life, stop by Herbal Nail Bar in Naples. We try to accommodate walk-ins, but we encourage you to book an appointment online to secure your service. We look forward to treating you at our Naples nail salon!